Please don’t utter that phrase. 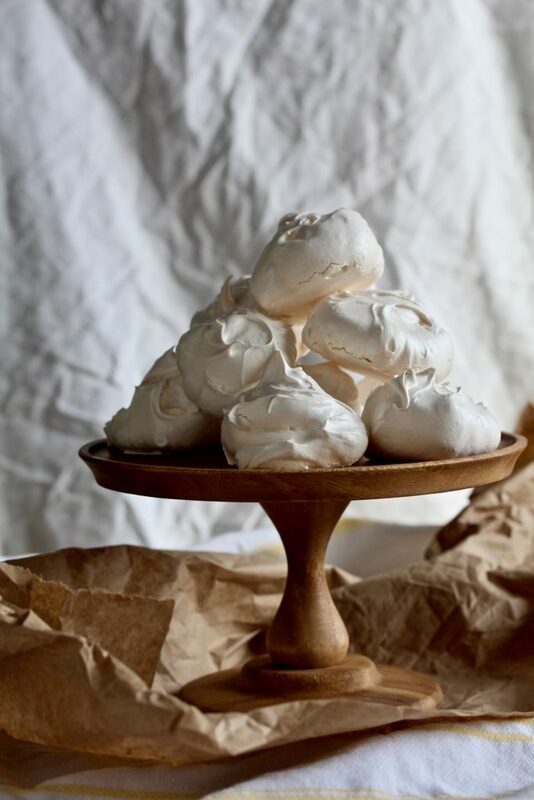 Because you can absolutely make meringue. It’s just a matter of a few tips and a wee bit of practice. Trust me, I get your apprehension. It seems like making meringue requires so many steps. Cracking eggs, whipping them to peaks (what the heck does that even mean? ), then baking them for TWO hours? Seems like a gargantuan waste of time, especially since the steps intimidate right off the bat. You sure can. And like I mentioned, I’ve got just what you need to succeed. I think you’ll find it’s a heck of a lot easier than you imagined. So easy, that you’ll be making these all of the time to impress your friends and family. They’ll think you went to pastry school, but really you just went to “Sara school.” Ha! Are you ready for these great tips? I thought so. 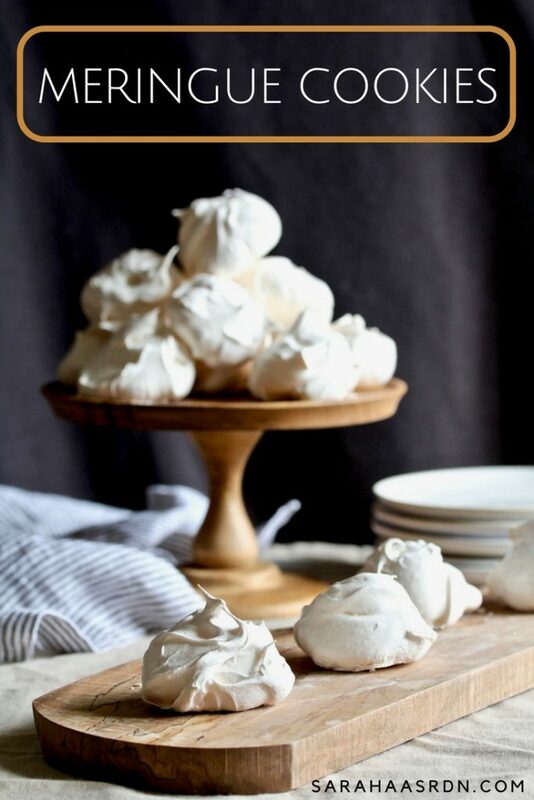 Trust me, these will help you create the most beautiful meringue cookies every single time! Keep it clean! That’s right, to make meringue, you don’t want any fat on any of your equipment. To ensure it’s clean and ready to go, blot some white distilled vinegar or lemon juice on a paper towel and wipe off the inside of your mixing bowl and your whisk or whisk attachment. Go with cold! To make the job of separating your eggs easier, do it when they’re cold. Do that step first, before anything else too. That way your whites will be at room temp by the time you’re ready to use them. So, so fine! Disclaimer – By no means do you have to do this step, but I really find that it helps. Process that granulated sugar for about 30 seconds so that the grains are a bit finer. This makes it easier for them to be incorporated during mixing. Low and slow! The old adage is true here too! A low temp, for a long time is what it takes to cook these little beauties. Don’t rush a good thing. Know what I mean? Just a pinch! Yes, add just a pinch of salt to these. Why? Salt brings out the sweetness and what’s not to love about that!? Intimidated by egg whites and whisking them? Don’t be! 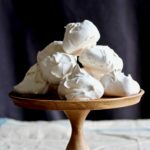 I’ll show you how easy it is to whisk them to perfection to create these lovely Meringue Cookies! Preheat the oven to 225’F and line two large baking sheets with parchment paper. To the bowl of a very clean stand mixer, add the egg whites and cream of tartar. Whisk at medium speed until foamy and soft peaks begin to form. With the machine running, add the pinch of salt and vanilla extract. Then add the sugar, 1 teaspoon at a time, to the bowl. Once all of the sugar is added, increase the speed to high and beat until mixture is glossy and the meringue holds stiff peaks, about 5 minutes. To test it, rub a little bit of the meringue between your fingers. If it feels gritty, keep whisking. 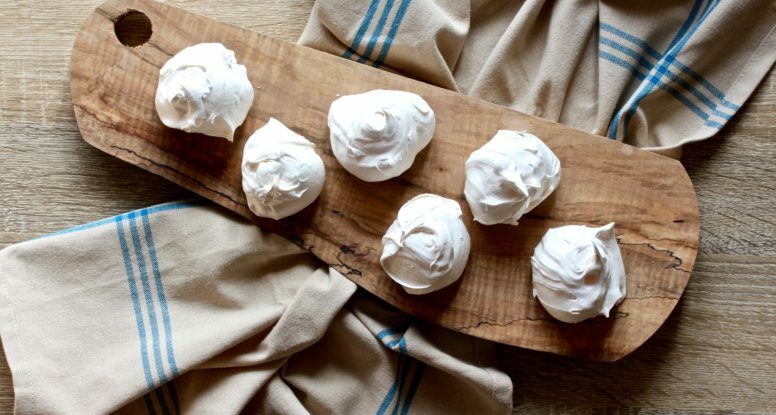 Using two spoons, place dollops of meringue about 1 inch apart, on prepared baking sheets. Bake for about 2 hours, rotating the pans once halfway through cooking time. Remove from oven, let cool slightly, before removing from parchment and placing on cooling racks. Place in an air-tight container to prevent softening and spoiling. Start with clean kitchen tools: Wipe the inside of your bowl and the whisk attachment with vinegar before getting started. Any fat will make it hard to make meringue. Separate eggs while they’re cold. My husband would love these! I’ve always stuck to easy drop cookies, but these would be a fun surprise for him!